Here's a room that serves many functions. A converted loft space, it works as a home office, a TV/gaming den for the owner's children, and a slick, stylish home cinema. The cost? Less than £10,000 – and that includes all the hardware, plus design, installation and calibration. Handy. While the premium picture palaces delivered by professional install outfits are guaranteed to get us salivating, a dedicated movie room doesn't have to be über-expensive. Proof, if you need it, comes in the shape of this basement theatre undertaken by FAB AV from St. Albans, with hardware and installation costs coming in at under £10,000. You know what it's like. Movie night arrives and you realise that you haven't got enough seats for all the friends you invited over for that Lord of the Rings marathon. Garden chairs, poufs and bean bags can all be deployed, but it's not quite what you had in mind when you planned your cinema den. In this eye-catching multipurpose room delivered by CEDIA-award-winning installer Cyberhomes, the emphasis is on discreet multichannel audio, simplistic control and everyday use. It's a good example of how to combine a regular living area with bigscreen entertainment. Home cinema install: C'est magnifique! AV install specialist Finite Solutions has offices in London, Cheshire and Leeds, but its work isn't limited to just the UK. This dedicated cinema room occupies what was formerly the billiards room of a chateau in rural France. C'est la vie. This basement movie den in South West London is the work of custom installation professionals MD Integration, and is slightly unusual in that it was commissioned by the developer of the property rather than the owner. In the capital's red-hot housing market, it should certainly help the six-bedroom new-build stand out from the crowd. This elegant media room was designed by Essex company Simply Cinemas, for a movie fan who wanted a space that could quickly switch between bigscreen projection and regular living area. More importantly, inquisitive young children meant that nothing was to be 'on show' when the system was not in use. With that in mind, the finished room features wall-hung speakers, a drop-down projector screen, AV components tucked out of sight in a low-slung cabinet and even two 'invisible' subwoofers. Once you've had a demo of D-BOX seating, it's hard to look at your regular sofa again in the same way. It's no surprise, therefore, that the owner of this bespoke cinema room was seduced by the 'movie motion' experience after an initial recce at UK distributor Pulse Marketing, and insisted it was part of the conversion plan. As such, all the seats (from US brand Fortress) were ordered 'D-BOX ready'. The two prime seats in the front row are fitted with actuators – the remaining six can be upgraded easily whenever the owner wants. The award-winning project was undertaken by Midlands company The Big Picture, with the owner demanding a 'cutting-edge' cinema to match the modern-day tech of his new-build property. The installer was naturally responsible for AV, but also the interior décor, and the way both are mixed together is impressive. 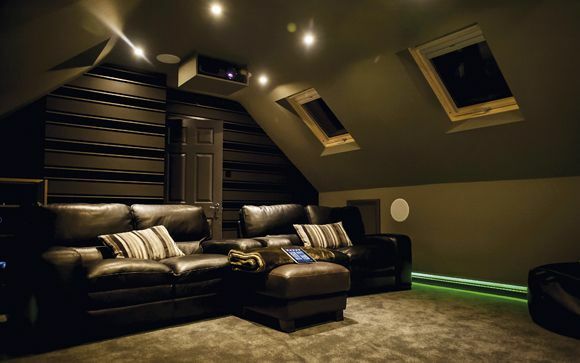 An attic is an obvious place for any ambitious cinema fan to install a dedicated system. Firstly, it's probably not being used for much beyond storing boxes of junk. Secondly, it's not likely to get much (if any) walkthrough traffic – you can retire to the loft and relax with a movie in peace. The setup featured here has been achieved by custom install professionals, and the price tag, we're told, is commensurate with the level of hardware, control and acoustic treatments employed. But even for those with limited budgets it's certainly an inspirational makeover that could give you some ideas for your own project. The owner of this smart-looking media room didn't originally set out to own it. He'd actually called upon custom install outfit The Big Picture to establish home automation electronics throughout his house, with the idea of constructing an additional space for a dedicated cinema. But when this proved untenable, The Big Picture suggested turning the family snug into a movie palace. 'Being open to ideas, I challenged them to impress me,' he tells us. Home cinema install: Welcome to the AV playroom!